If you were out and about in the East End for the Jazz Festival this past weekend, it's likely that you spotted a stack of cubes delineated by the surging and darkening LED lights along their frames. 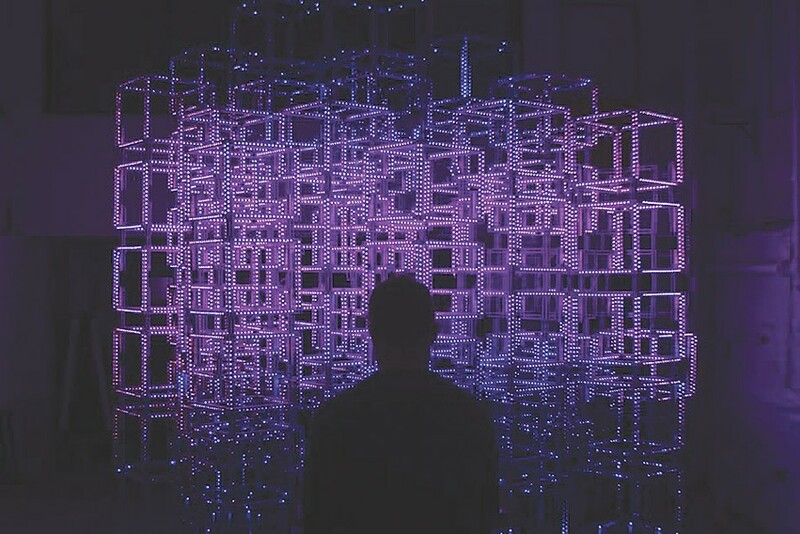 The installation, "Cubes," is an interactive light sculpture by Alexander Green. Using technology developed by Green and Symmetry Labs, a San Francisco-based technology and design company founded by Green and Trip Vest, the work uses light as a visualization for accompanying music. Rochester Contemporary Art Center (137 East Avenue) will host this outdoor installation through Monday, June 29. A second and final performance will take place that night between 7 p.m. and 8:30 p.m., with music from Herb Smith & The Freedom Trio. A discussion and reception inside RoCo will follow the performance (only 90 tickets are available at $20). For ticket purchase or more information, call 461-2222, or visit rochestercontemporary.org.